Since Amanda moved down to California, I have been using her new found American zip code to mail all kinds of crafty goodness to save on international postage. At $20+ per parcel to Canada, shipping adds up quickly and seriously eats in to my fabric budget. 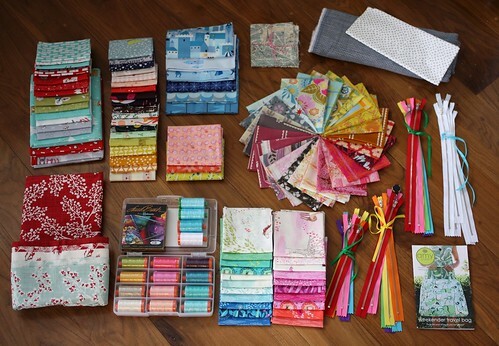 Knowing I'd be seeing her in February, like any sane irrational quilt fabric addict, I took full advantage of the situation and ordered unquestionably the mother load of all craft hauls. Did I mention my loot took up her entire suitcase last week when she flew home?! Nothing says I love you more than cramming your essentials into your husbands' carry on just to bring 40lbs of fabric glory to you cousin. Yah I know, she's the best right?! 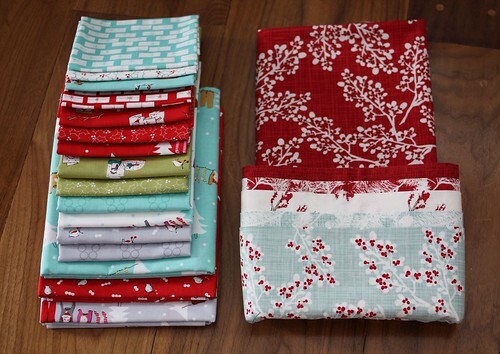 Getting a head start on next Christmas, I finally caved and ordered some FQs and 1/2 yds of Aneela Hoey's Cherry Christmas, one of my all time favourite holiday lines. Another classic line I wanted yardage of was Kate and Birdie Paper Co.'s Winter Lane (of which I found grey prints locally on sale after Christmas but couldn't find red or aqua). I was so grateful to find these lines on etsy as I know both are nearly sold out. Sarah Jane's Wee Wander is likely to be my favourite release in 2014. 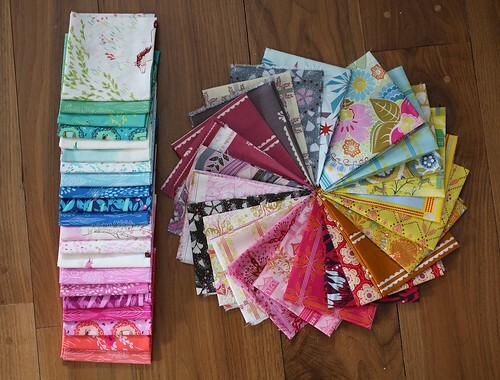 I bought a FQ bundle from Westwood Acres and I picked up this incredible voile bundle at the same time. I had major regret last year at sewing summit when I didn't buy this voile bundle during the Westwood Acres pop up shop, so I knew I needed to get it while I still could. Soooo pretty and so silky soft! Lizzy House can't do any wrong as far as I'm concerned. 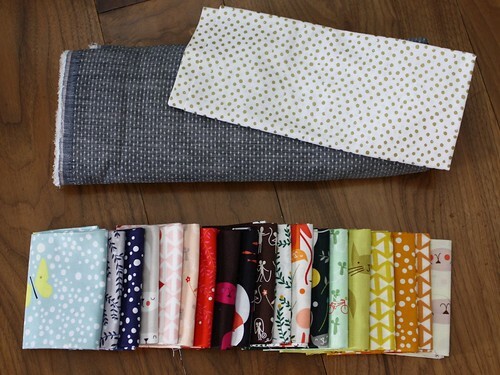 I ordered a FQ bundle of her newest line Cat Nap from Gather Here on etsy and I swooned when I opened it up. Easily another favourite line for 2014. Shamefully this haul doesn't include the 10.5 yards that I shipped to my house in January for Lizzy's Cat Nap Dress Contest (pictures soon I promise!). Since I had already gone too far and practically sold the farm, I figured I couldn't resist a bit of chambray and metallic dots for Hawthorne Threads as well. Sometimes when you're in this deep you might as well keep digging amiright? I think when it comes to fabric it's right at least. During the #greatfabricdestash on IG, I scored a half yard bundle of Lizzy House's Castle Peeps. This is now safely tucked away with my Lizzy collection including the likes of 1001 Peeps, Constellations, Pearl Bracelets and Cat Nap. 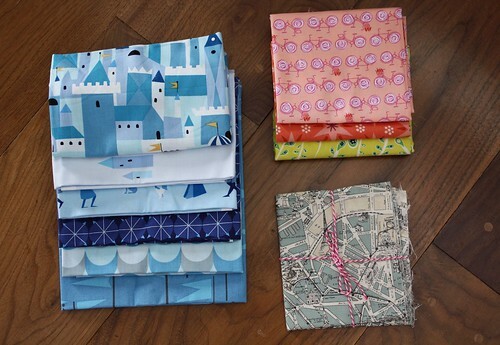 I also scored a FQ of peach bikes, a 1001 peeps Lizzy print, and my most coveted piece of my stash now, a Paris Map FQ. Lastly I stocked up on a few notions that are terribly difficult to find in Canadian shops. 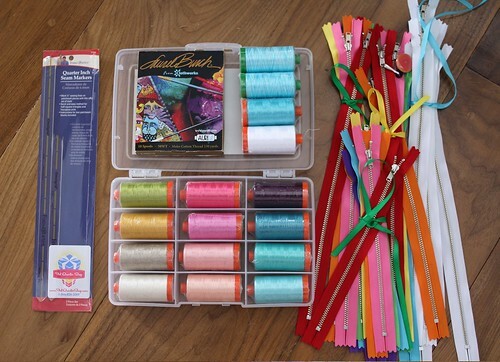 I score a quarter inch seam marker for marking HST,16 large spools and 10 small spools of aurifil purchased in a huge sale from Fat Quarter Shop before Christmas, and 36 metal zippers from Zip It on etsy. *To clarify, I realize that this is an absurd stash post but I did do a lot of research to make sure that if I blew my budget I would have no regrets. I have coveted a number of these older prints for ages and I know that if I only buy a few lines in 2014, I will not be disappointed with wee wander and cat nap. I'm going on a fabric buying diet asap now though for sure! I've never been so excited to sew exclusively from my stash!!! What great additions for your stash! haha- you're so funny Kelsey. I'd probably do the same thing though if I had someone in the US that I'd visit semi-regularly! That is an awesome haul! Some of my favourites in there. And I have wee wander envy! !